Designed to be a managed, digital-ready, self-contained network in a box, SimplEdge allows organizations with branches to deploy technology with speed and consistency—at hundreds of sites or even thousands. SimplEdge is a comprehensive new concept in enabling digital transformation for organizations with branches. Designed to be a managed, digital-ready, self-contained network in a box, SimplEdge allows organizations to deploy technology at scale with speed and consistency—at hundreds of sites or even thousands. SimplEdge helps enterprises work smarter by delivering business-aligned, high-performance experiences users and customers expect. We leverage our global footprint and local expertise to deploy all your locations with speed and consistency while lowering costs and improving security. Most importantly, we take care of all the behind-the-scenes legwork and management so you can focus on your business. Powered and managed by Black Box, SimplEdge features state-of-the-art solutions from industry leaders combined with design, deploy, and managed services from certified Black Box engineers and technicians. 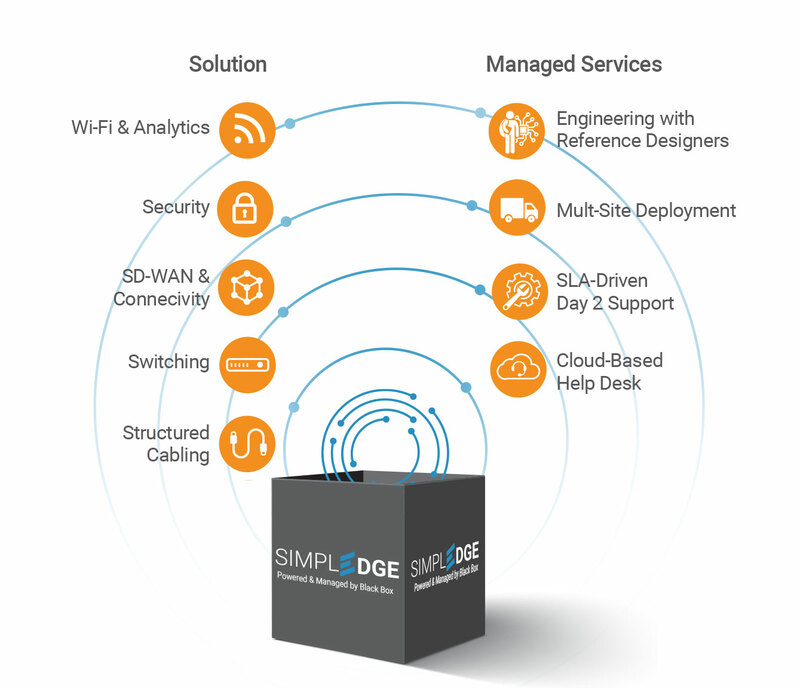 As a solution, SimplEdge is a complete "network in a box" and contains everything required to build a modern branch network that meets the requirements of digital transformation-structured cabling, switching, SD-WAN with carrier connectivity, security, and Wi-Fi & analytics. As a managed service, SimplEdge is deployed and managed for you—engineered with reference designs for the different branch forms factors, deployed across branches uniformity, supported Day 2 with committed SLAs, and serviced by a cloud-based help desk.